Shallow areas along the corridor allow floodwaters to slow and spread. Many horse farms or facilities have a stream or drainage way on or near them. Storm water runs off from these operations. It frequently contains fertilizer, herbicides, pesticides and manure. These substances seep into local streams. A storm water and soil management plan protects streams and the entire riparian corridor. A riparian corridor consists of the streambed, banks, surrounding flood zone and uphill slopes. It provides habitat for a variety of plants, fish and other organisms. When working properly, such a corridor will keeps water clean. However, heavy and repeated flooding, trampling by livestock and over grazing damages it and pollutes the water. Reduce or eliminate pollutants and sediment in streams by good management of pasture and manure. Keep livestock out of streams. Provide drinking water away from the stream. 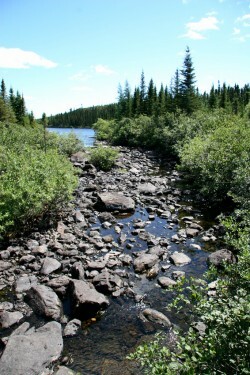 Stabilize or restore the stream corridor, if needed, to protect the water. Straight stream channels lined with concrete or stone move floodwaters through faster. However, they reduce habitat and increase flooding downstream. A natural approach through effective riparian corridor management reduces downstream flooding. Buffers help sediment deposit on the stream banks, protecting habitat and water quality at the same time. A stream needs revitalization if it has steep eroded banks, bare shores, and fast moving, muddy water. A naturally restored stream has curves, riffles and pools. Shallow areas along the corridor allow floodwaters to slow and spread. Replant eroded stream banks and buffer zones. If your stream is degraded, ask for recommendations and assistance from your extension office (which you can find here or here) or private or local government specialists.